Outdoor puppet theatre company Frolicked will be performing a specially commissioned new show at the Parsonage next Wednesday 27 and Thursday 28 August. Museum visitors will be able to watch and interact with the performance, which has been inspired by the Brontës and the Parsonage. Visitors will be able to see the Brontës’ servants come to life in unexpected places around the Parsonage and its grounds. The company will be working at the museum and creating informal performances throughout the day. Frolicked is a puppet theatre company based in Huddersfield, who specialise in designing, creating and performing with puppets in interesting and unusual spaces and locations. There are also plenty of Contemporary Arts and Education events to interest museum visitors over the coming bank holiday weekend. 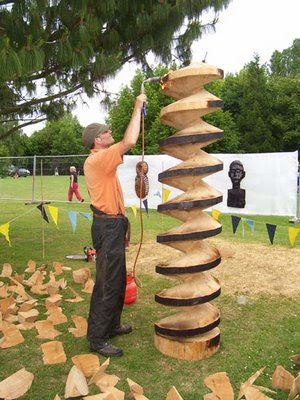 Today (22 August), chainsaw artist Dominic Clare (see below) will be carving a sculpture from a tree that was felled in the Parsonage garden earlier this year. You can watch Dominic Clare at work throughout the day at the Brontë Parsonage Museum. A reminder - currently on show at the museum is My Life Dreams: an exhibition of digitally manipulated photographs based on the Brontës by Swiss artist Annelies Strba. Visitors will also have the rare opportunity to see the famous portrait of Emily Brontë painted by Branwell, which is on loan from the National Portrait Gallery. All events are free with normal admission to the museum. That he has a great affinity with nature is very striking when one sees the large-scale site-specific commissions he has produced for public places throughout North Wales. One can immediately appreciate the depths with which he has responded to the sites, his thoughtful research into their historic origins and the ways in which his pieces are sensitively integrated into the environment. It's already well known to lovers of the work of Charlotte Brontë. Now Birstall's Oakwell Hall is set to play a starring role in a major television adaptation of Wuthering Heights, her sister Emily's classic tale of romance and revenge. The Elizabethan manor house has been picked as one of the locations for the filming of the drama, which is being made for ITV by production company Mammoth Screen. Oakwell Hall's first brush with fame came in 1849, when Charlotte Brontë used it as the basis for a house called ‘Fieldhead’, the home of the heroine in her novel Shirley. In 1921, the historic building was also chosen as a location for a silent movie version of Shirley. Wuthering Heights cast members include former Coronation Street favourite Sarah Lancashire and Andrew Lincoln, who played Egg in cult BBC Two show This Life. Band of Brothers actor Tom Hardy will portray Heathcliff while newcomer Charlotte Riley has landed the part of Cathy. Filming meant that the hall was closed to the public for four weeks to allow for two weeks of filming plus time for the preparation and dismantling of the sets. Now re-open, the hall which was built in 1583 by John Batt, offers visitors an insight into the workings of a post English Civil War household. The two-part drama for ITV1 is expected to be shown autumn 2008. The filming of Wuthering Heights at Oakwell Hall is now finished. It will be shown on ITV1 in two ninety-minute episodes. The staff at the hall told us all about it – more later. In 1921 a silent version of Shirley was filmed at the hall, and the search for this is still going on. We are holding a sponsored Luddite walk in North Kirklees - where Charlotte Brontë set Shirley. On 7 September 2008 at 1.30pm it will start at the Dumb Steeple in Mirfield, with North Kirklees Rambler Association member Ken Dews as the leader. A talk will be given on the route the Luddites marched in 1812 by Luddite expert Dr J A Hargreaves. Funds raised on the walk will go to Hollybank School in Mirfield which the Brontë sisters attended between 1831-1836 when it was called Roe Head. The school now caters for severely disabled young people aged five to nineteen, who are resident at the school, educated and cared for by dedicated staff. Also - the Ramblers Association have a stall at the Mirfield Show on Sunday 17 August where details and sponsor forms can be picked up. This is held near the site where Blake Hall stood - where Ann Brontë was a governess. Only the South Lodge remains. Below, Charlotte Riley as Cathy and Tom Hardy as Heathcliff. Background vegetation may or may not be in the vicinity of Oakwell Hall. In this version by Blackpool writer Peter Bowker, Heathcliff kills himself when he hears of Cathy’s death.